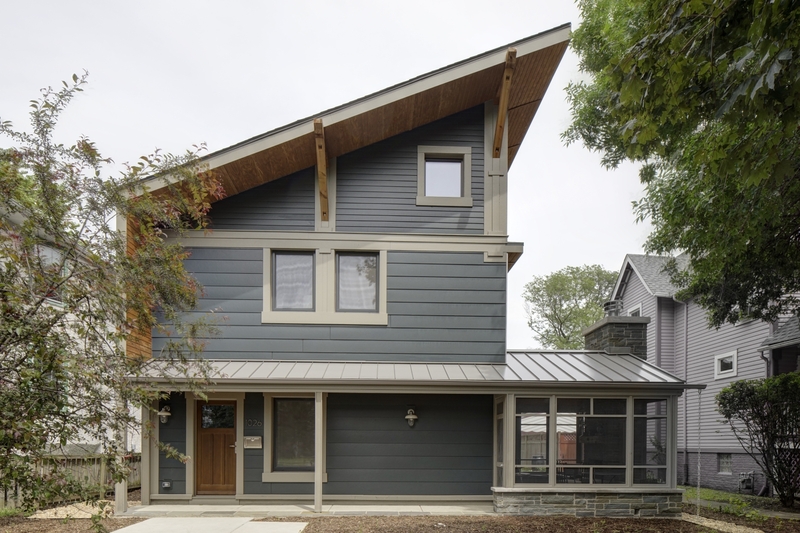 This new Oak Park infill house exemplifies a vision for 21st century housing: a low-energy, delightful, and healthy environment that furthers the sense of place inherent in Oak Park’s early-20th century neighborhood. 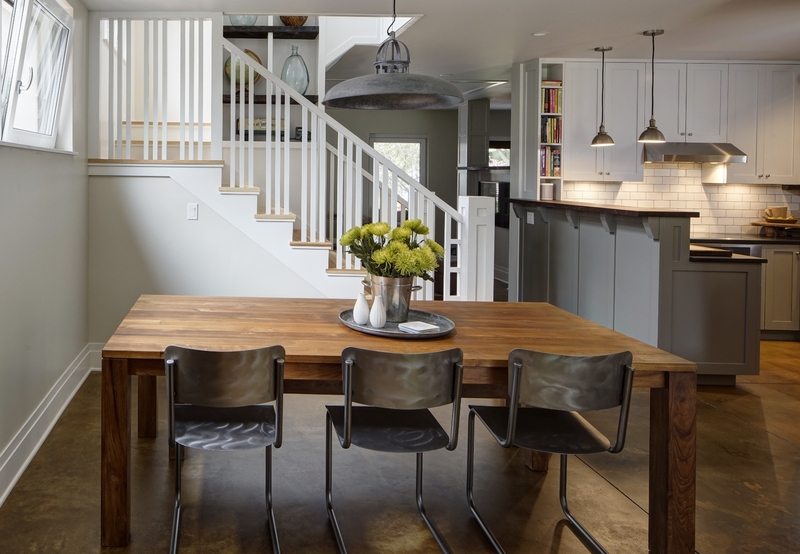 Simplicity is a theme shared between the Bungalow and Passive House eras, and this house captures that simplicity while optimizing efficiency and performance. This project is pre-certified for PHIUS+ 2015 and certified LEED-H Platinum. Energy modeling (using WUFI-Passive) began early in Schematic Design so that window sizes and performance, insulation levels, overhang sizes, space conditioning, and ventilation could reinforce the spatial and structural concept, and vice-versa. Concurrently, construction assemblies and materials were established by early detail review and pricing with the builder. 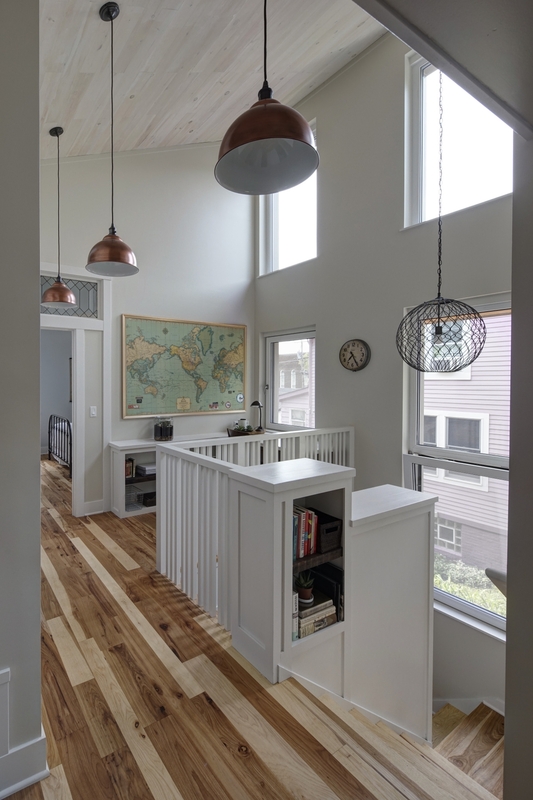 The owners put a premium on indoor air quality (due to allergies) and low energy consumption (for environmental responsibility and low energy bills), and recognized that quality design would allow more investment in a smaller project. The Passive House model fit this project well since it provides continuous, filtered ventilation and ultra-low-energy consumption through economical means (insulation, airtightness, and compact form). A modest plan size was developed (1,700s.f. net, 1,960s.f. gross), with slab-on-grade first floor. 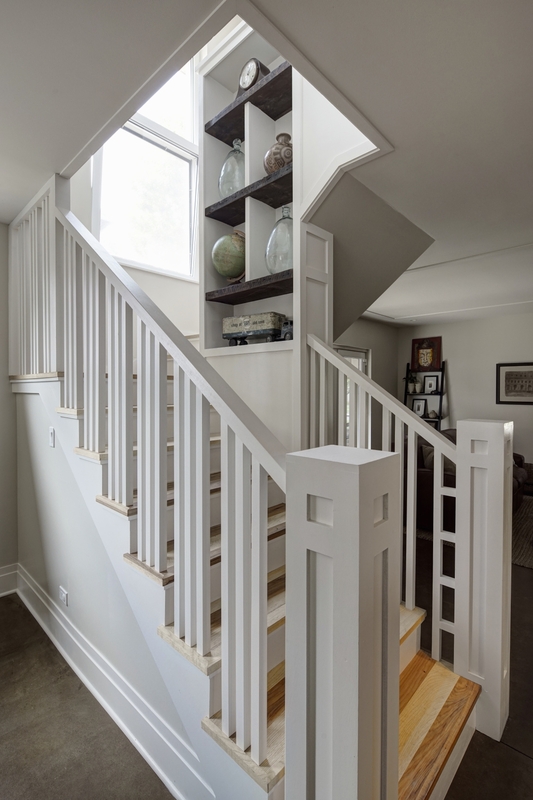 The upper level ceiling slopes up to the south to capture sky views and solar gains; the stair allows that light and energy to flow to the main level. 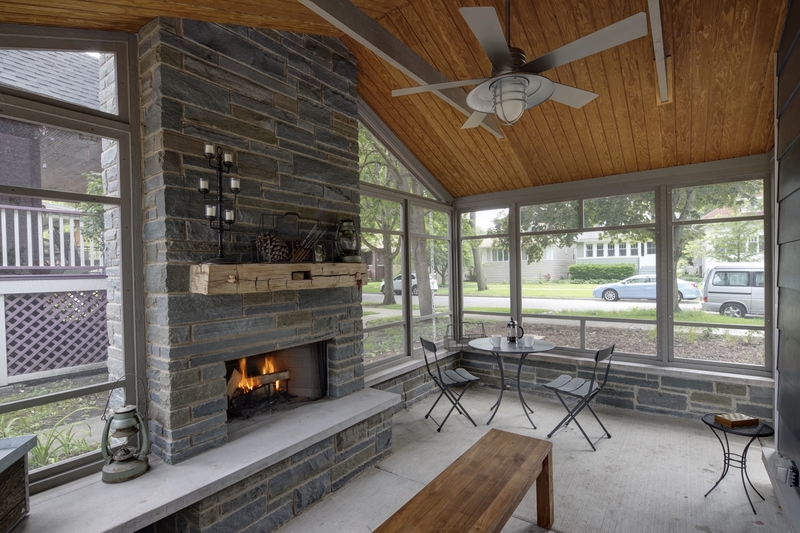 The front screened porch is a reinvention of the traditional front porch—a place to socialize, enjoy the outdoors, and enjoy fire on cool evenings. Thermal-bridge-free detailing required innovative solutions for the frost-protected shallow foundation, window openings, and eave attachments. The mechanical system is a model of simplicity, with a continuous ERV (0.3 air changes per hour whole-house) running separately from a single ductless mini-split (heating and cooling/dehumidification). 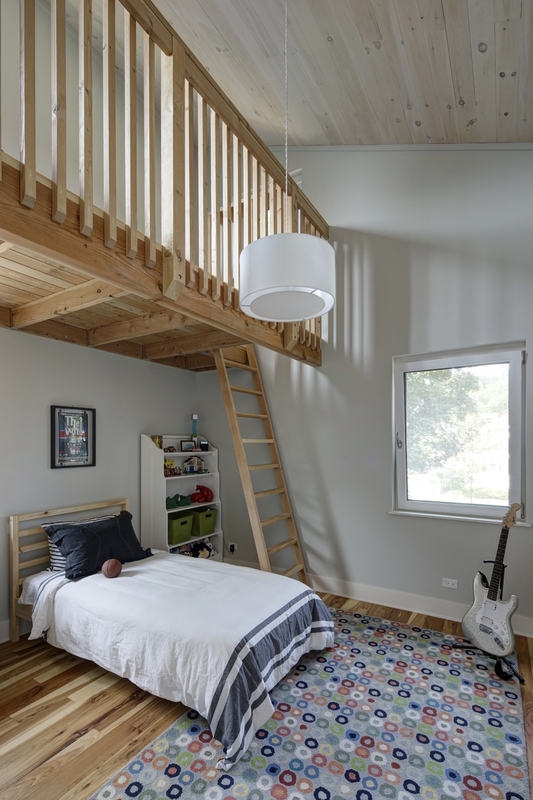 A lesson learned on this project was that if one doesn’t duct space conditioning, one should provide high and low passive ventilation (through transfer grilles) for the bedroom spaces since, in our case, the east and west bedrooms can have differential temperatures beyond comfort. 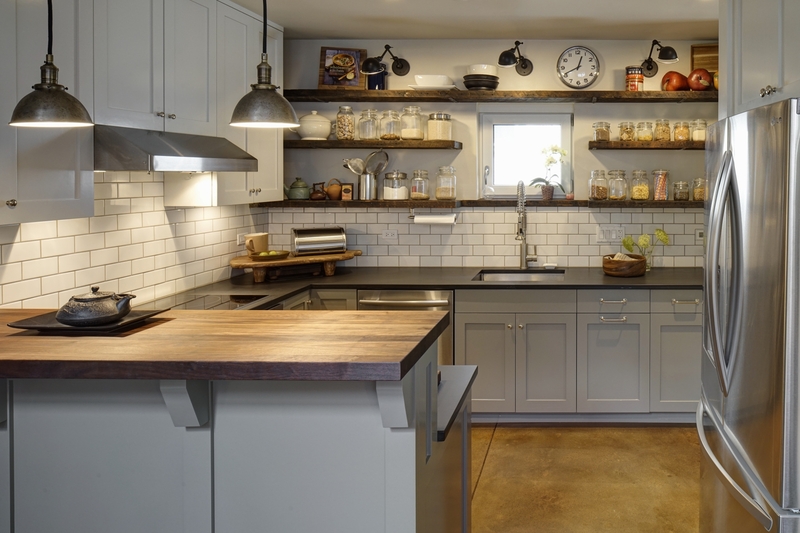 Great care was taken in specifying non-toxic materials: no-added formaldehyde cabinet construction with water-borne finishes, zero VOC, non-toxic floor finish and paints, Greenguard certified drywall and subfloor adhesives, caulks, and sealants, salvaged wood (not previously finished), etc. Third-party air quality testing showed Total VOC of only 48 parts per billion prior to move-in, and formaldehyde of 46ppb. The CARB residential formaldehyde guideline is below 27ppb for residential chronic exposure; since we had no specified added-formaldehyde construction materials, our count is likely due to furniture and other off-gassing, and will drop as the house is ventilated. Mold readings were below outdoor air. An energy monitoring system was installed so the owners and design team can track energy use compared to modeled predictions. Measured results also contribute to a clearer understanding of energy use for future energy models across the industry, which is one of PHIUS’ objectives. Although early in occupancy, the owners appear to be running this all-electric house at about 500kWh per month, below the modeled prediction. The owners plan to install a PV array within the next year.